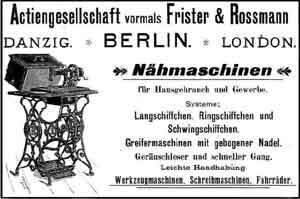 A brief table to enable you to approximately date your Frister and Rossmann machine. Where two numbers appear on your machine the first only is necessary in order to date it. By 1897 this practice had ceased. For some models and in some countries there was only ever one number. At some point after WW2 the numbers reverted back to 000 again! 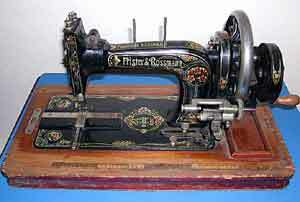 There is little reference to this model in F&R’s advertising so we do not know for how long or in what quantities these machines were manufactured. 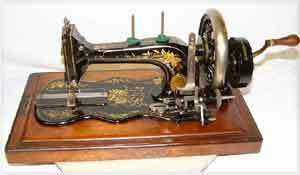 An example from the mid-1890's is known however. 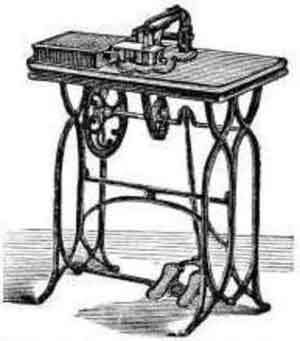 The first machine advertised as an 'interpretation of the Wheeler and Wilson sewing machine'. Made in Berlin. 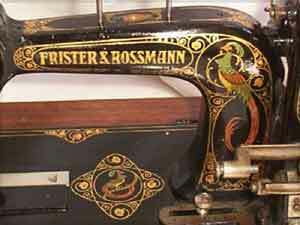 The earliest advertisements found are for the Wheeler and Wilson type machine with curved needle which was available as both a treadle and hand machine, these were still being made into the 1900’s. Possibly designated model Lit A. 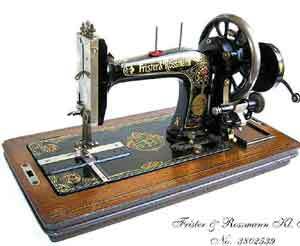 Data elsewhere suggesting the factory began to make these machines in 1875 however with information on available factory output it does appear they began to make this model as early as 1872. 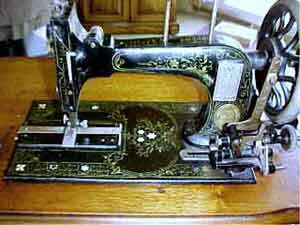 This machine was available as a hand or treadle machine. 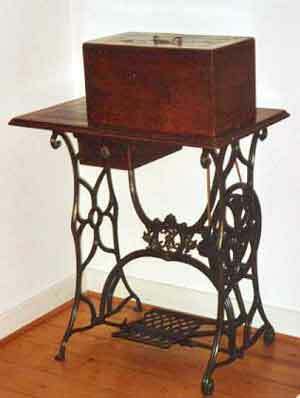 The hand version was available on either a wooden base with wooden lid or on a cast iron paw footed base. Was this machine designated model B? 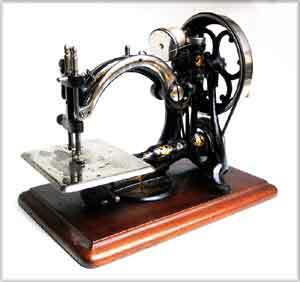 The rectangular plate shows suitable thread thicknesses according to the needle size used. The strange silver pull down lever on the vertical rectangular front piece of the above model has been replaced by an access hole to the right. Later this is omitted altogether. 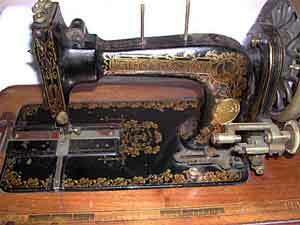 A third slide plate has appeared to the front of the machine. 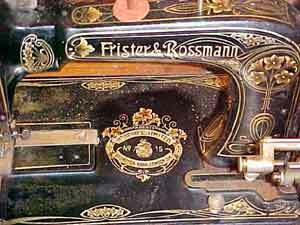 These decals had the longest run of all the TS machines being made from 1908 until at least 1938. 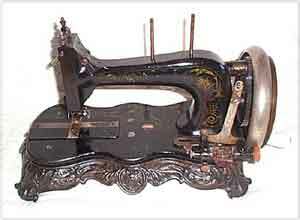 After 1920 the letter K appeared on the inside of the arm and the model underwent more variations. 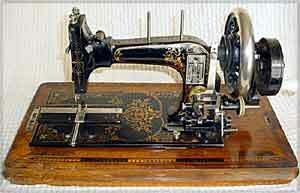 The above machine but branded to the London department store Harrods. 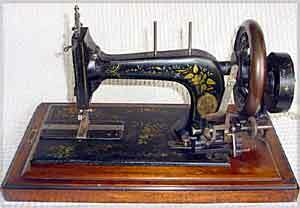 These machines were sold by the shop until 1914. 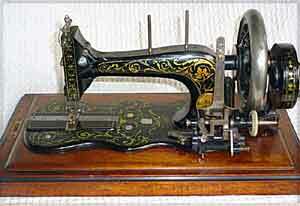 Note the change in bobbin winder. The face plate also varies from the early models which had a black painted and decorated face. Data from Alte Nähmaschinen by Peter Wilhelm. 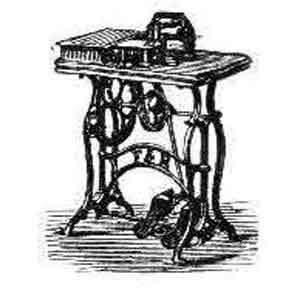 Many thanks to everyone who has filled out the NeedleBar Survey and to the members of NeedleBar, Treadle On and Ismacs who have shared information, pictures, researched and acted as translators. Special thanks to; Erna Van Burik, Uwe Dierkes, Jon Cnossen, Gary Nelson, Bonnie, www.handcrank.co.uk, Friedel and Ursel Niggemann, Randle McBay, Dorothea Glorius, Lyn & Eric Forsyth and Marco Rudin for the use of their material.